Looking for an event to warn away those winter chills and excite your musical tickles. The Great British Guitar Show is the biggest guitar showcase event in the United Kingdom. Industry players put their best foot forward to bring to the fore front the best guitars and accessories available. Also next generation guitar will be on display and anyone with an inclining in the guitar world will attend. The event also intends to connect players from musicians to makers to audience members to interact and understand the role of the guitar as the instrument making music waves in today’s entertainment scene. The Great British Guitar Show at the New Bingley Hall in Birmingham is the place to be. For two days from on both the 25th and 26th February, 2017 the best display of skill and talent in performance on the guitar will be on display. The show will open from 10:00 am to 5:00pm each day. The show seeks to help showcase and display guitar and guitar accessory from different music stores and musician from all over the UK will be showcasing. Free clinics will be offered to look at guitars and offer advice on repairs and management. Add also demonstration of how to use some new guitars and accessories like electric guitars, bass guitars, acoustic guitars, amplifiers and effects among others. Live performances from UK’S top guitar acts will be the highlight of the whole showcase. There are a lot of great guitarists that have recorded music over the years. There’s just something about a player who is one with his instrument, like it’s an extension of his or body. Many of these great guitar performances are lost to time because the technology to record them wasn’t available widely in the early 1900s. Luckily for us recoding technology has improved over the years and hundreds of great concerts have been committed to tape. Crossroads was originally called Crossroad Blues, written and recorded in 1936 by the legendary Robert Johnson. Many of Johnson’s songs have been covered over the years but Cream’s live version from the 1968 double album Wheels of Fire is the most famous. Why? Because of the way Clapton restructured the song. He turned it into a standard tuning twelve bar blues rocker. And to make the song even better Clapton played not one, but two guitar solos on the track. The first solo is a pretty straightforward blues solo but the second, while remaining a bluesy feel, is a blazing solo that proves once and for all why his nickname was God in the 1960s. If you get have a moment look up other live performances online to see and hear for yourself. If you know a keen guitar player who has a birthday coming up, you’re probably looking for gifts that fit around their hobby. If you don’t know how to find the best Valentine’s Day gifts for her or him we will help you.Here are 5 great ideas for gifts that guitar players are sure to love. Whether your guitar playing friend is always losing picks or simply has a huge collection, giving them their own pick maker is a gift that keeps on giving. 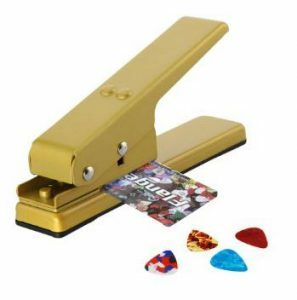 Looking a little like a hole punch, this cool gadget allows the user to punch out their own picks from all kinds of plastic substances like credit cards and loyalty cards. 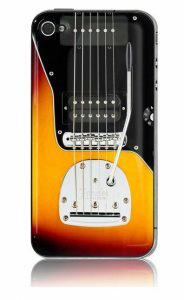 A great idea for any guitar playing enthusiast, an iPhone case that looks like the frets of a guitar is a brilliant idea. You can even find one to match their favorite instruments, whether that be an acoustic or electric guitar. For the guitar player who is also a whizz in the kitchen, a guitar shaped cooking spatula is just ideal. Perfect for reminding your friend of their love for music whenever they whip up an omelette, an awesome durable plastic spatula in the shape of their favorite instrument can even be used as an air guitar while cooking up a storm!